Join us on our chartered bus and earn CEU credits on your way! Please contact Katie Hitt at khitt@aiadallas.org for sponsorship or trip information. We will begin the day with a training session at the AT&T Conference Center. This is where the breakfast tacos come in! During the session you will be briefed on our priorities and legislative agenda, as well as have any questions or concerns addressed so that you may go into your afternoon visits with confidence and ease. After the training session we will head to the Capitol, where you will have the opportunity to meet with your representatives to voice your concerns and/or support for potential legislation. 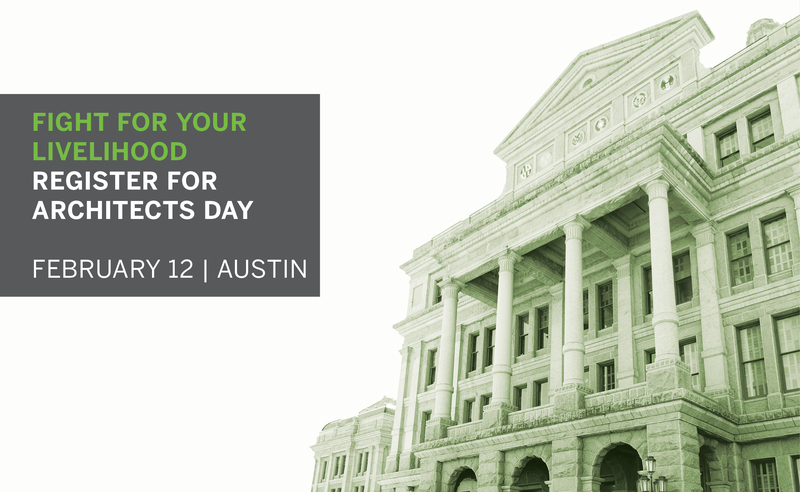 While contingency lawsuits will be a major focus of conversations taking place during Architects Day we don’t want to miss an opportunity to showcase architects’ role in two of the big conversations happening this Legislative Session – Resiliency and Safety. Hurricane Harvey and its historic flooding highlighted the need for the best possible community design and planning to ensure resiliency and public safety. This type of community planning is what architects bring to virtually every design project. In designing for Health-Safety-Welfare (HSW), architects must specify products and materials to make structures capable of withstanding weather’s worst and guarding against man’s cruelest intrusions—while looking beautiful and lasting long enough to become landmarks in the process. Last year’s tragedy at Santa Fe High School brought an intense focus on the safety of Texas students and how design can improve their survival chances. Texas architects are committed to working with state and local officials and other community leaders to maximize safety and security at all educational levels. In conjunction with the Texas School Safety Center, the Texas Society of Architects is at work on a strategic policy initiative to provide design-driven recommendations to mitigate school violence, both for existing facilities and future campuses. Design can make a difference in keeping Texas students, faculty and school personnel safe and secure. The design and construction industry has seen a trend of overly broad lawsuits being filed by attorneys working on a contingency fee on behalf of school districts and other political subdivisions alleging non-specific or potential construction defects. The reality is construction and design defect lawsuits are being filed without the client ever previously identifying a problem with the design, construction or operation of the building. Design professionals and their public entity clients are being hurt by rising insurance premiums, higher deductibles and legal fees. Ultimately, these lawsuits reduce competition, increasing costs to the taxpayer while simultaneously reducing the quality of what is built. The Texas Society of Architects supports establishing a “Right to Repair” for design and construction of public facilities and requiring any money awarded in contingency suits to be used to fix the problem for which the suit was brought. We are anticipating bills will be introduced between now and February 12th that require our advocacy attention. This will likely include bills to support as well as bills to oppose. As these issues arise, we will share more information. Please note that we have allowed room for flexibility in the agenda and will provide the most up to date information for you on Architects Day.